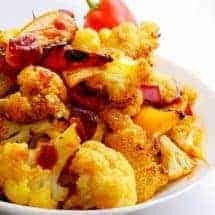 This very simple Healthy Baked Gobi Manchurian recipe has all of the taste and not of the unhealthy oil of a typical Gobi Manchurian. Quick way to enjoy Indian-Chinese food at home. Or, how to have Chinese food that even the Chinese have never tasted. But before we go too far down this path, you need to understand what Indian-Chinese cooking is, and what Gobi Manchurian is really about. Indian-Chinese food is like nothing you’ve ever had before. Not in India and definitely not in China. I can say this from having eaten extensively in both countries. Really if Indian Food and Chinese Food had a baby who was determined to be as different from its parents as possible–while still carrying their genes–you’d have Indian-Chinese Food. 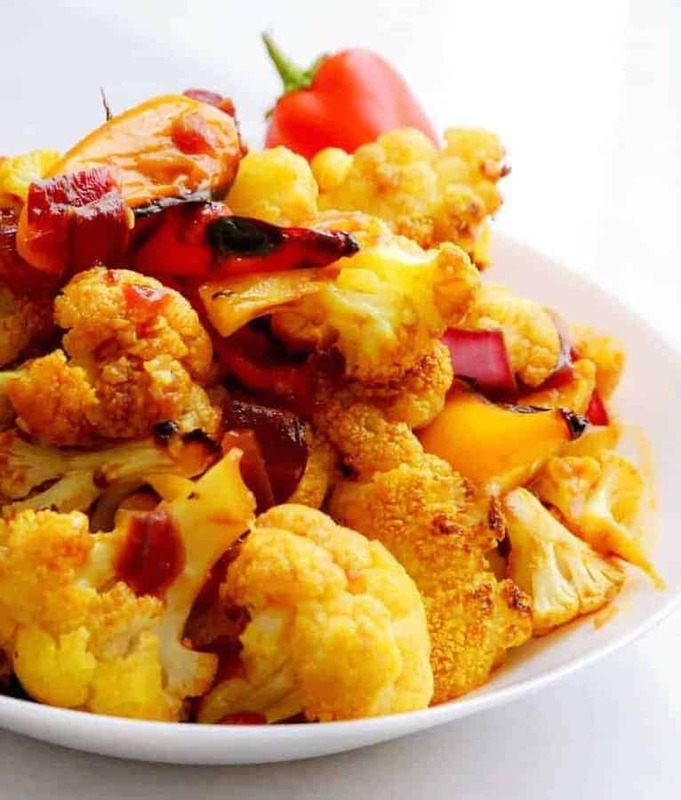 It is really a selection of dishes that takes into account Chinese seasoning and cooking techniques–but adapting them to Indian tastes, and the availability of Chinese cooking ingredients in India. It is said to have been developed by a small Hakka community that migrated to India over a century ago. What this means is that there are several vegetarian dishes, and a lot of use of cumin, coriander, turmeric, hot chilis, and sometimes even yogurt. So Chicken Chili, Chicken Manchurian, Chicken Szechuan, Sweet and Sour Chicken–when made in the Indian Chinese fashion, won’t taste like anything else you’ve ever had before. Within Indian-Chinese cooking, Manchurian refers to a spicy brown sauce, usually flavored with ginger, garlic, chilis, soy sauce etc. 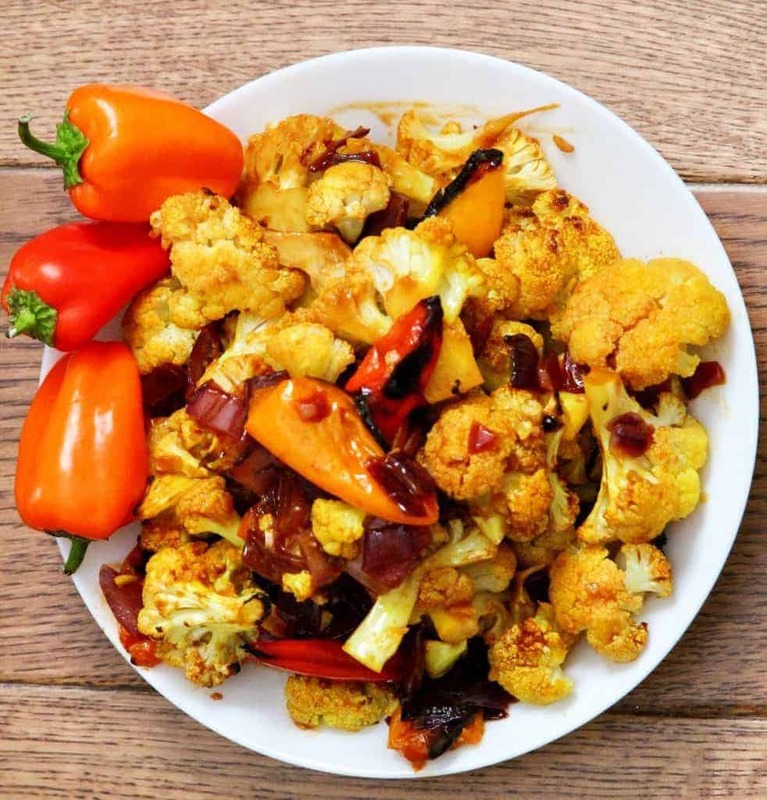 Typically the gobi (Cauliflower) is battered with cornstarch and fried–like making Indian Pakoras. It is then either mixed in with a sauce, or poured into a “gravy” which is more of a soupy liquid thickened with corn flour. But I don’t like to fry things and the main flavor of traditional Gobi Manchurian to me, comes from the sauce anyway. So I decided to roast the vegetables, and then pour the sauce on, so as to make this healthier. 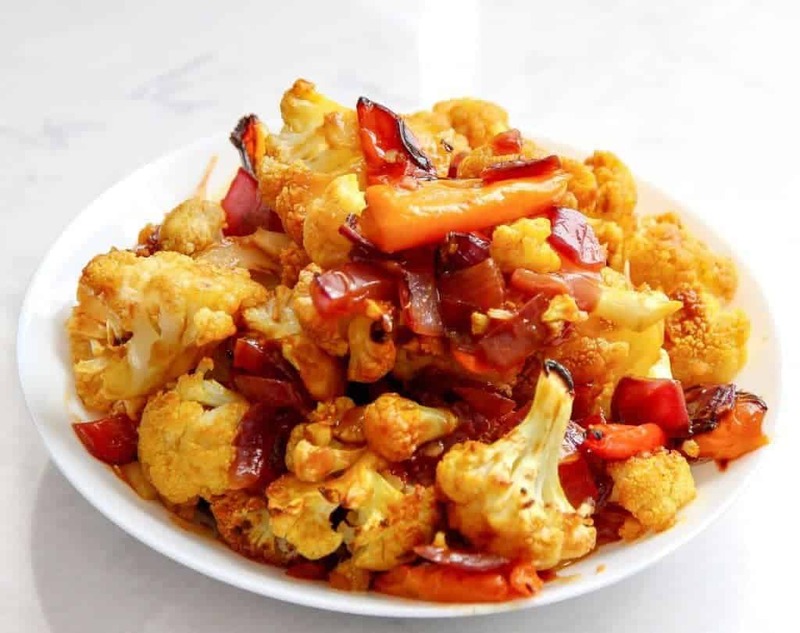 Very simple Gobi Manchurian recipe has all of the taste and none of the oil of a typical Gobi Manchurian. Quick way to enjoy Indian-Chinese food at home. Line a sheet pan with foil and turn on your broiler. Sprinkle the veggies with oil, salt, and turmeric. Mix well and place veggies on foil-lined sheet. Broil for 30 minutes or so until the veggies are cooked. Meanwhile, in a microwave safe bowl, mix together all the sauce ingredients and microwave for 30 seconds. Let this sit while the veggies cook. When the veggies are done, remove from the oven and pour sauce on them, mixing as you go. I want to try this it looks so amazing….a bit over my carb liking…thinking its just the ketchup causing the carbs….reg ketchup has 5 carbs per tablespoon , reduced sugar ketchup (both are Heinz…has 1 carb per tablespoon…but has succralose in it….is that one of those sweeteners that makes your body react the same as if was sugar?…. I am diabetic and sucralose is legal for me to use for low carb.